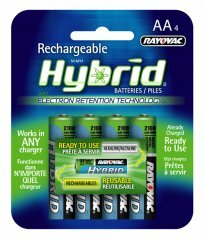 Unlike other rechargeable batteries, Hybrid batteries are pre-charged during assembly, and hold onto that charge so they are ready when you are. They also have a much lower self-discharge rate than other Nickel Metal Hydride (NiMH) or Nickel Cadmium (NiCd) rechargeable batteries so you can leave them in a camera or TV remote without them rapidly bleeding out their charge and going dead when you need them most. Each battery can be recharged up to 500 times, so they pay for themselves after the first few uses. You also don't need to worry about whether they will harm your device; as long as it takes AA or AAA batteries, these excellent rechargeable batteries will work great. Bulbster.com only carries products of the highest quality standards, and is happy to offer only Rayovac brand rechargeable Hybrid batteries. Add 14 for free shipping.